The artery to the ductus deferens (deferential artery) is an artery in males that provides blood to the ductus deferens. The artery arises from the superior vesical artery or the inferior vesical artery, which in turn arises from the anterior branch of the internal iliac artery. 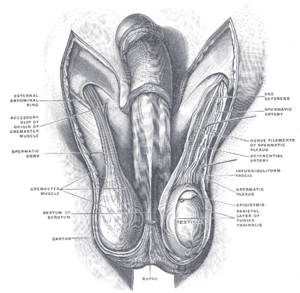 It accompanies the ductus deferens into the testis, where it anastomoses with the testicular artery. In this way it also supplies blood to the testis and epididymis. A small branch supplies the ureter. Artery to the ductus deferens.Deep dissection. Lateral view. Anatomy photo:36:07-0302 at the SUNY Downstate Medical Center - "Inguinal Region, Scrotum and Testes: Layers of the Spermatic Cord"